A journey through the life of the extraordinary Sicilian photographer and anti-Mafia activist Letizia Battaglia. A story of passion, pain and the struggle for freedom. At 37 Letizia, together with her 3 daughters, left a husband whom she had been married to since the age of 16 and became a journalist. She picked up a camera when she found that she could better sell her articles if they were accompanied by photographs and slowly discovered a burning passion for photography. After years of racing on her vespa to the crime scenes with her camera, Letizia found she had accumulated an archive of death and decay of Palermo and its citizens. 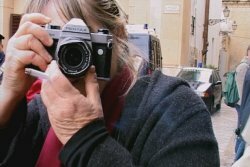 She knew she had to do something about what she was witnessing and, using her photographs, became one of the first to denounce the activities of the Mafia. She then went on to be a local environmental politician, a publisher and an activist for justice. Even though Letizia has documented so much pain, decay and death, she retains an incredible passion for life. BATTAGLIA paints a uniquely intimate portrait of this warrior of a woman. The contrasts of the city of Palermo provide the background, Letizia the foreground. The style of the film matches her inexhaustible energy, and creates a story made of a collage of memory, thoughts and her award-winning black & white photographs. Documentary film maker Daniela Zanzotto is a director, producer and camera woman on her films. With little training in film making, Daniela she set off to Paris in 1997 to make her first documentary"If the Walls Could Speak" (52 min) which was widely screened at international festivals. Daniela's second documentary "Kissed by Angels" (BiFF 2002) was transmitted on the Sundance Channel and Channel 4, UK. Director Daniela Zanzotto will be available for Q&A after the screening.